The Davis Report- The Patterson site…more photos. 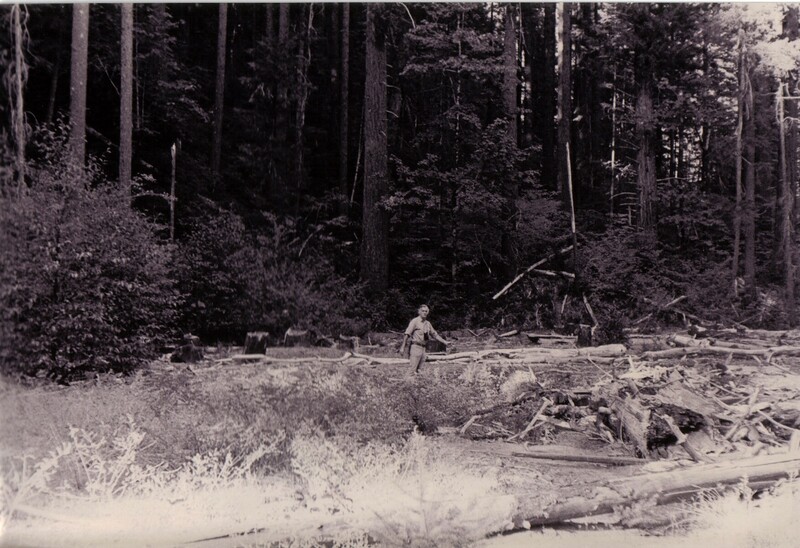 This photo of the filmsite was provided me by a veteran researcher who regularly visited Bluff Creek both before, and after the filming. This researcher has been to the site many, many times since the filming. This photo is circa 1980. Click on the image to enlarge. Please do not right click. The photo below compares the above photo to the place that I personally believe the site to be the site. Click on the image to enlarge. Take a look at the image below. This is the TAKER of the 1980 image above, there on the right below. His wife is in the foreground. The man in the center is Rene’ Dahinden. He(the taker of the image) is a kind man and a spiritual person. I won’t disclose the head or face out of regard for him. We should all be thankful that he more than adequately documented his visits to the site. This documentation, I hope, will prevent ignorance from completely removing the site from history. But…wait a minute…it’s not ignorance that we should fear is it?…A popular quote has it, that it is the “illusion of knowledge” that we all should fear. Click on the image to enlarge. This image is looking upstream at the site from downstream. 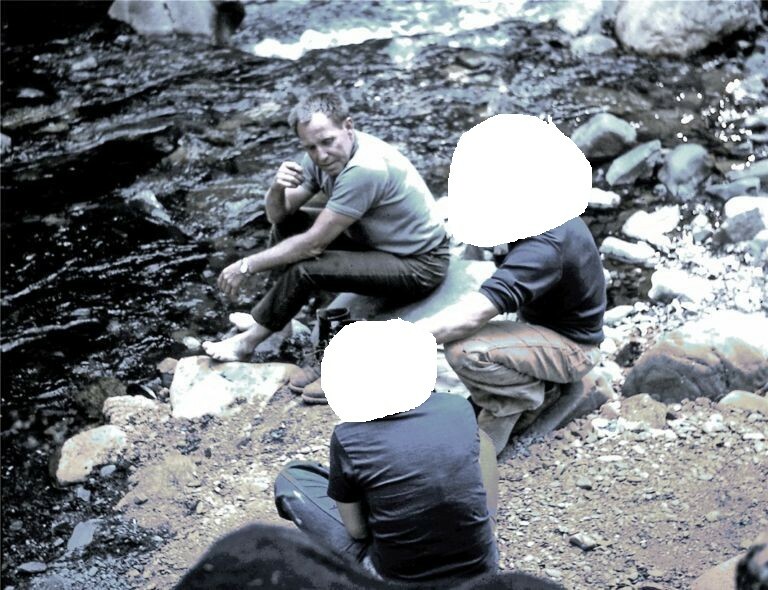 The person in the center has been blurred to protect privacy. 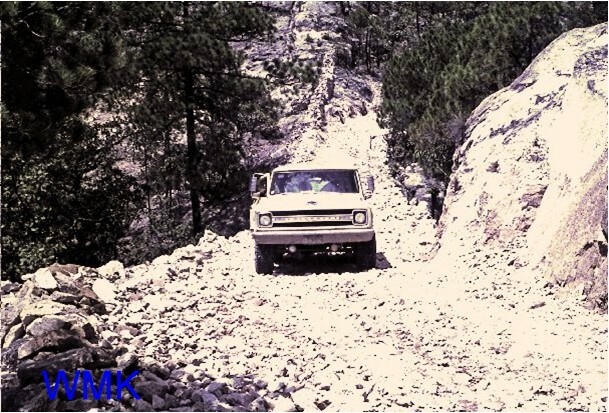 The photo was take in the 1970’s by the same veteran researcher who took the other images Click on the image to enlarge. 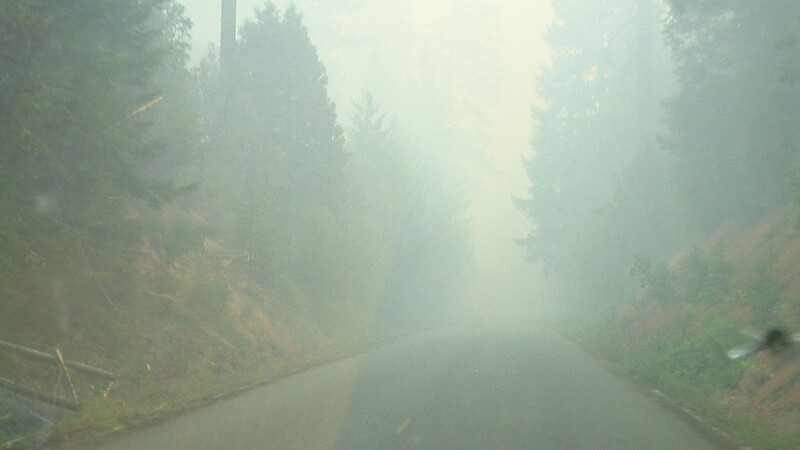 This is the road down to the site. Click on the image to enlarge. 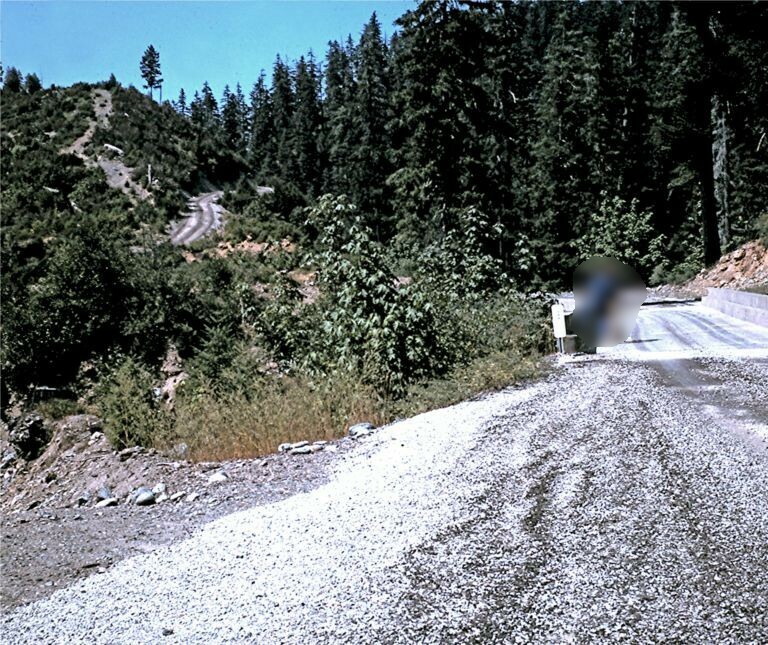 Here’s the Notice Creek bridge around 1975. Notice the clear cut on the upstream side. Click on the image to enlarge. 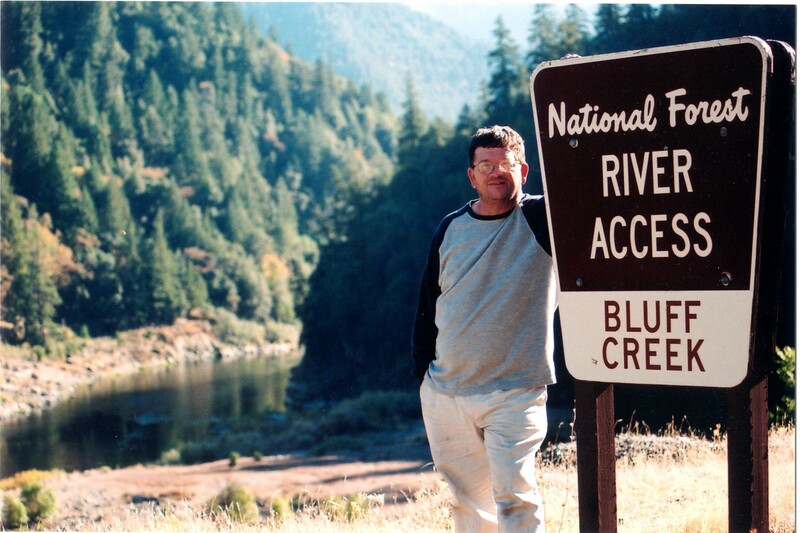 The veteran researcher Peter C. Byrne made the trek from the bridge shown above, upstream to the site. He used military methods for estimating the distance which are quite accurate for those who have been trained in them. He put the site at 2.0 miles even. When I went in there myself. My fellow researcher,”D”, had a GPS hand held device. The device said that the site was 2.1 miles from the bridge. This agreed quite well with Mr. Byrne’s estimate, and the photos above with my name on them, were taken from that spot. Here is Mr.Byrne at the site. There is no question, that he is at the right place. This photo is courtesy of Peter C. Byrne. Click on the image to enlarge. Copyright Peter C. Byrne. Please do not right click. Look at the fade animation below. Notice how much that the site has changed in the few years between the photographs. Click on the image to animate. Copyright Peter C. Byrne and Patricia Patterson respectively. Filmwork by M.K. Davis Please do not right click. The Notice Creek bridge and the Bluff Creek bridge are very nearly alike. Some have mistaken one for the other in photographs. Including myself. Here is the corrected image. 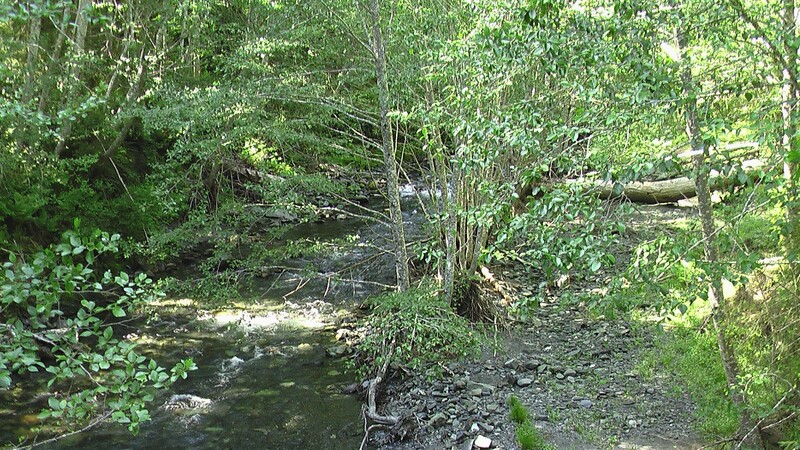 In the image below and on the right, Notice creek is a much smaller creek with a more rapid flow. It flows into Bluff Creek just a bit downstream from this bridge. When you are going toward Louse Camp, Notice Creek bridge is the SECOND bridge and is only a short distance from there to Louse Camp. I am taking the photo looking back up the road. If you walked the opposite way that Bryan is walking, Bluff Creek bridge is not too far down the road. In the photo on the left, the direction of approach to the bridge is different than that on the right. 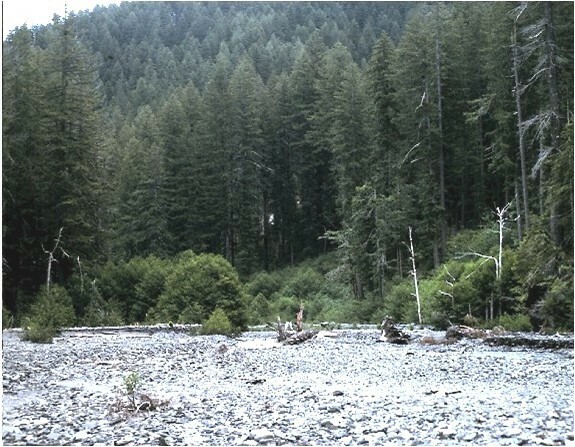 The significant thing about all this is that there was significant logging occurring along Notice and Bluff Creeks, as you can see that the replanted timber has had time to grow as of the 1970’s. This is now reforested. Click on the image to enlarge. Here’s my son Bryan on the BLUFF CREEK bridge, resting after hiking all the way in from the main road quite a few miles up the road there. This is the first bridge that you will encounter. Click on the image to enlarge. Copyright M.K.Davis. Please do not right click. Here’s the view, looking upstream toward the film-site, 2 miles upstream. 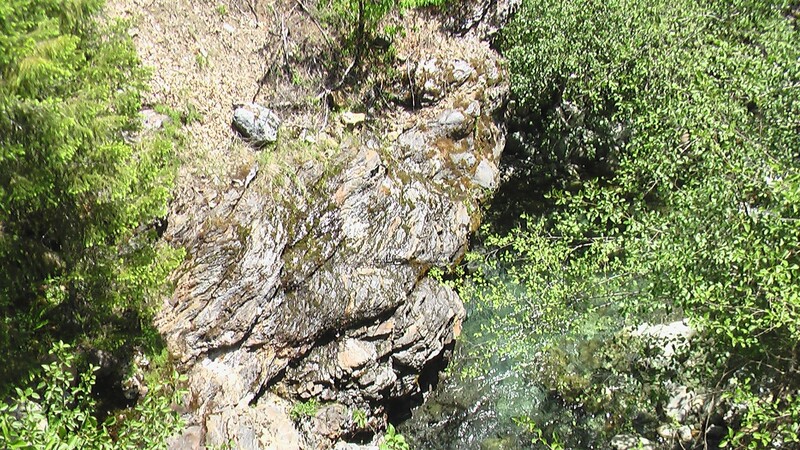 Patterson and Gimlin were said to have entered the creek drainage here. Click on the image to enlarge. 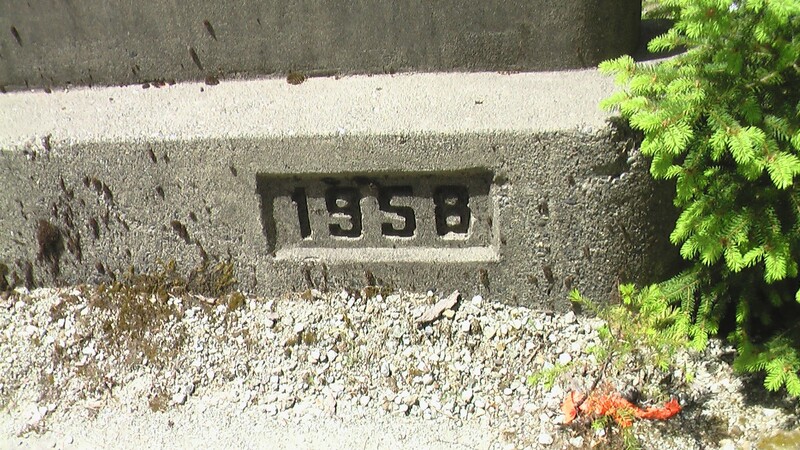 Here’s the date on the notice creek bridge. Here’s the view from Notice Creek bridge, looking downstream. It converges with Bluff Creek only a short distance from the bridge. Click on the image to enlarge. 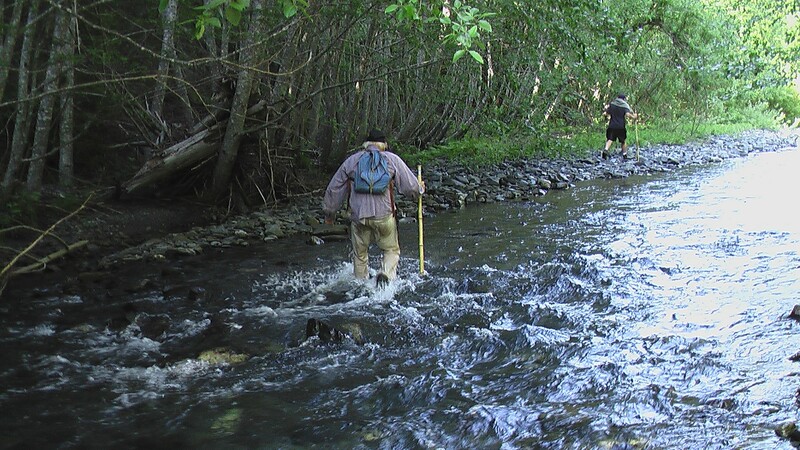 Here’s my son Bryan and Don Monroe, trekking up Notice Creek. The water flow is much less than Bluff Creek, but was much faster. The trek up the creek was a very difficult one. Click on the image to enlarge. Here’s another photo of Bryan and Don in front of me making our way up Notice Creek. 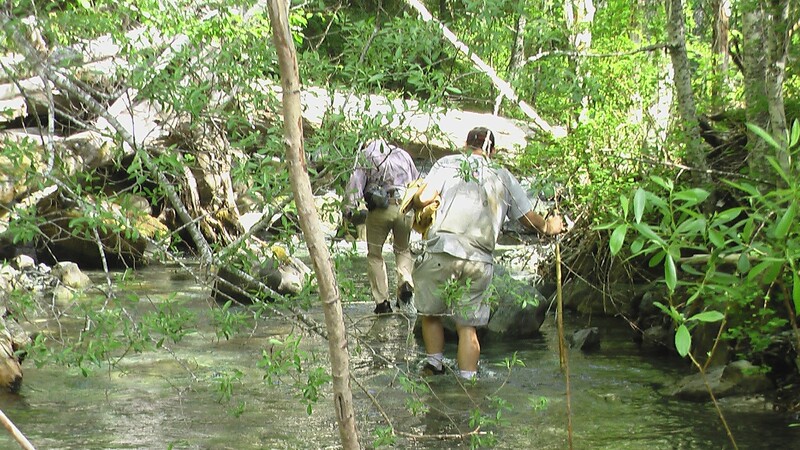 Here’s a photo of Bryan and Don hiking upstream on Bluff Creek. Click on the image to enlarge. 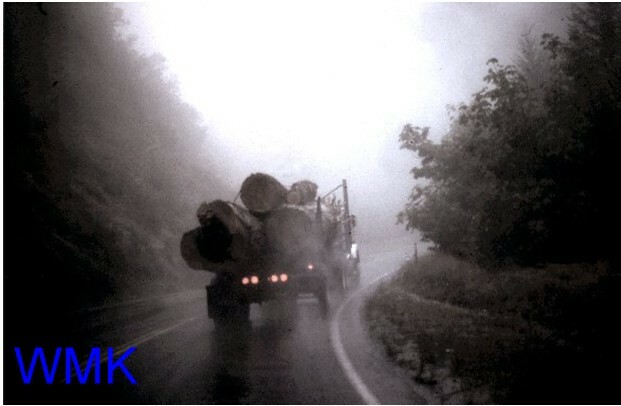 Here is a logging truck from the 1970’s on Hwy 96 near Bluff Creek. Notice the size of the logs. Unfortunately, logging interests took precedent over ecological and anthropological interests in those days. Click on the image to enlarge. 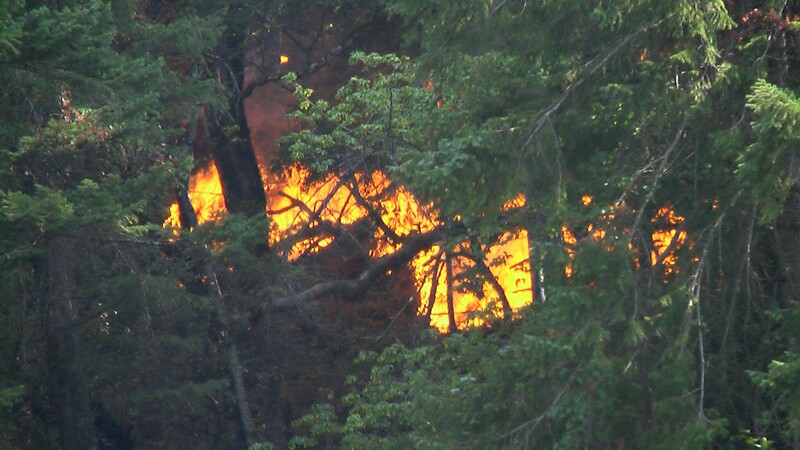 In the summer of 2008 the whole Bluff Creek area was on fire. There were over 2000 fire fighters from across the region, camped at Orleans. We spent some time with them and gave a presentation. Don Monroe and myself managed to get into the film-site with the help of the fire fighters themselves. They made a sign to put on the spur road that would let others know that we were down there. They made regular visits down to check on us. Eventually the site became choked with smoke and we had to pull out. 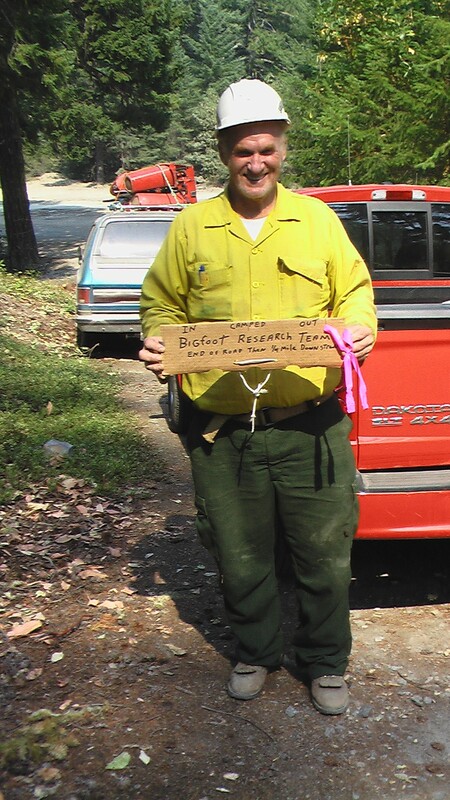 Here is fire fighter Don Raney, holding the sign after we came out. A special thanks to Superintendent Lynn Wilcox for the hospitality that was extended us. They even provided us with a hot meal. Click on the image to enlarge. Here’s the road going into Bluff Creek. Visibility was quite low. Click on the image to enlarge. 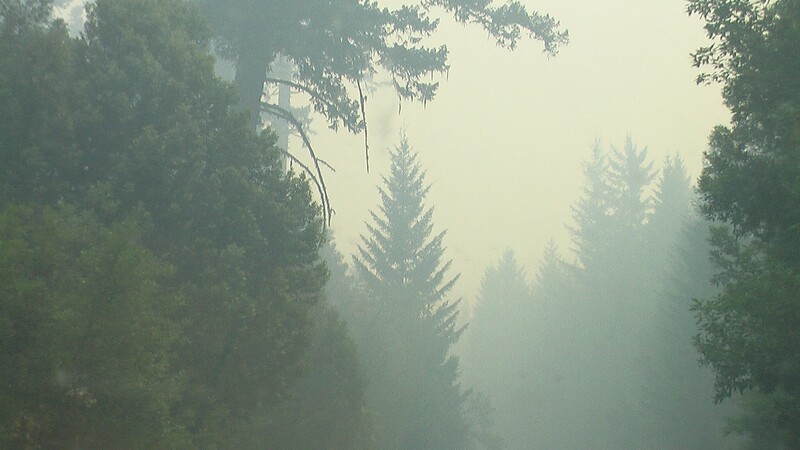 Here’s another shot of the smokey road in. Click on the image to enlarge. Here’s the fire up on the hill. Click to enlarge. 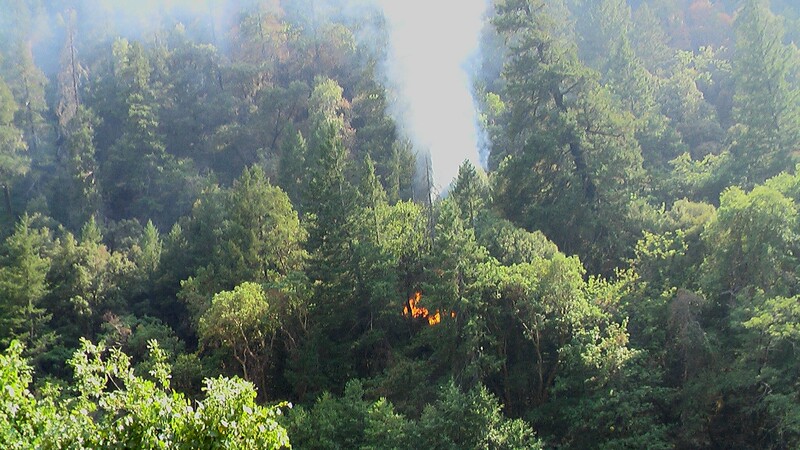 Fires are quite common in the Bluff Creek area. 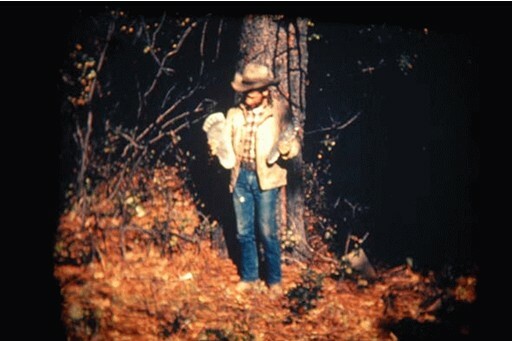 Roger Patterson is standing here, in front of a tree that has been burned on the trunk by fire. Notice the black lines. Click on the image to enlarge. Copyright Patricia Patterson. Please do not right click. The Davis Report-Why the Patterson film must be studied closely. It does not matter if there is “SPEECH” emanating from the mouth of the Sasquatch. The fact that the mouth is “MOVING” and that is a form of speech, in and of itself. It speaks volumes. It says…”I’m not a football helmet and I’m not a mask”. This is an animation. Click on the image to animate. More on the article by Kal Korff may be found here.